SI-91; ROM; Superior Race; Stakes Placed; 87 Race Points. 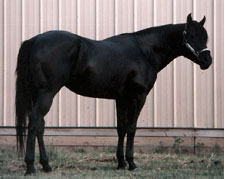 I purchased Copper Casanova in December 1982 with no intentions of using him for breeding. I was looking for a good gelding. Out of necessity and lack of any significant funds for outside breeding I bred Cas to several mares and was pleased with the results, especially with my Palomino Skipper W grand-daughter, ROMARS SUNRAY. Together they produced 6 foals, Stringfellow Hawke, Mr Macgyver, Bailarina de España (Dancer), Doña Casanova (YoYo), Balki Bartokamus, and Miss Murphy Brown. Dancer and YoYo are producing for me now. In 1984 I showed Cas in several open shows earning Reserve Hi-Point Aged Stallion with Tri-State Horse Show Association. In 1998 I showed his grandson, ROCKS BALDY, who won Hi-Point Aged Stallion in the same circuit. Cas was euthanized on March 22, 1993 after a pasture accident left him partially paralyzed and unable to stand. He is buried here next to his grand-daughter, BELLES NOELLE.